Realizing he has a free pass in the fourth dimension (aka time-travel) Mxyzptlk travels back to a time teenaged Clark Kent is considering becoming a Superboy. He fakes a future in which Superman is a tyrannical monster (the Injustice universe?) and that Lana is in a forced marriage with him. Not wanting to turn evil, Clark agrees to move to the moon and cut ties with others. In the present day Mxyzptlk finds not only that life is boring without Superman to challenge him but bad things happened to Lois, Jimmy, and the Kent, and even he feels bad. So he decides to just mess with teen Clark, but the boy isn’t having any of it. so Mxyzptlk just undoes everything and it all goes back to normal, Clark’s memory erased, but Pa saw him flying off in his costume. However, he thinks it was a dream, and he has an idea how Clark can protect his identity. What they got right: It’s a good concept, and well executed. Mxyzptlk is always fun to watch (although why he would abandon a hottie like Gzptlnz I’ll never understand…did she come from the comics?) and this is a unique plan for him. There’s also the little touches, like the pedestal Mxyzptlk puts “Superboy” on comes from “Pedestals Are Us: when you gotta stand for something”, and even this little imp is sad to see what happens to Clark’s friends without Superman around. 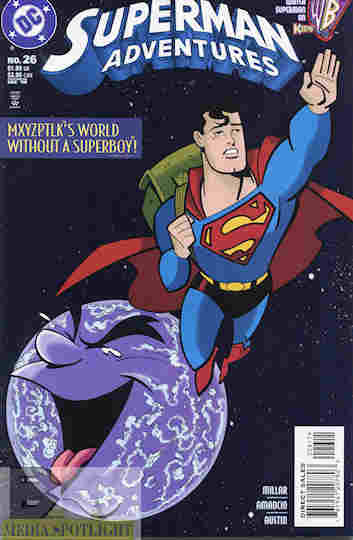 Recommendation: A great Superman/Mxyzptlk story. Track this one down. Posted by ShadowWing Tronix on February 3, 2018 in Animation Spotlight, DC Spotlight, Television Spotlight, Yesterday's Comics and tagged Clark Kent, DC animated universe, DC Comics, DCAU, Jonathan and Martha Kent, Mister Mxyzptlk, Superman, Superman: The Animated Series.